This card is for Stamping 411 #179 here. 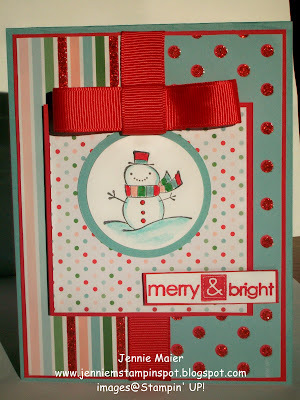 It used Candy Cane Christmas Specialty DSP and the matching A Cute Christmas stamp set. Real Red is the base with some of the striped paper from Candy Cane Christmas. There's more paper in the three rectangular panels and on the panel with the ribbon. I ran the Real Red thru the Scallop Edge border punch and added dots with the White gel pen. The only stamping is the sentiment from A Cute Christmas, inked up in Real Red and stamped on Whisper White. That was then punched out with the 1 3/8 in by 5/8 in Large Oval punch and layered on to a Real Red piece punched with the 1 3/4 in by 7/8 in Large Oval punch. 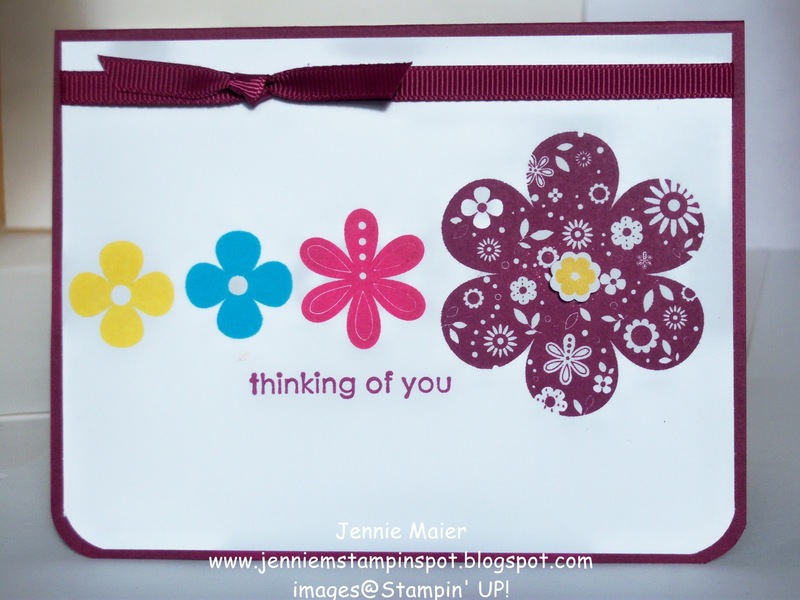 I popped that up with Stampin dimensionals. Finally, a piece of 1/2 inch Blushing Bride stitched-poly finishes it off. I need thank yous for my daughter's birthday presents so this is a quick one using the Clean and Simple FTL#118 here. I started with Poppy Parade card stock and added some DSP from the DSP Pack In-Color. I stamped the sentiment from Afterthoughts on a Whisper White circle that was cut from the Circles #2 Big Shot die. I layered that on to a Poppy piece punched from the XL 2 3/8 inch Scallop Circle punch. I added some dots with the White gel pen. I stamped the little flower from Apple Blossoms in Poppy Parade, cut it out and popped it up with a Stampin dimensional. This is my submission for the PPA#70 sketch here. I started with a Riding Hood Red card stock base of 5 1/4 by 10 1/2 and folded it in half. I used the 1 1/4 inch Square punch to punch pieces from the Love Letter DSP and matted them on a piece of Basic Black card stock. I inked up the image from Artistic Etchings in Riding Hood Red and rock and rolled the edges in Basic Black ink and stamped it on Very Vanilla. I added a Basic Black brad to the center. I then matted that on Riding Hood Red and Basic Black card stock, popping up the square with Stampin dimensionals. It's the day after Thanksgiving and that means the Christmas rush is on! I've gotta get going on all my cards that I send so I made this one with the MOJO #166 sketch here. I started with Always Artichoke for the base and added some Crumb Cake and Deck the Halls DSP. I colored the stamp from Bells & Boughs with the Always Artichoke and Cherry Cobbler Stampin write markers and stamped that on Very Vanilla. That was colored with the Classic inks and blender pens. 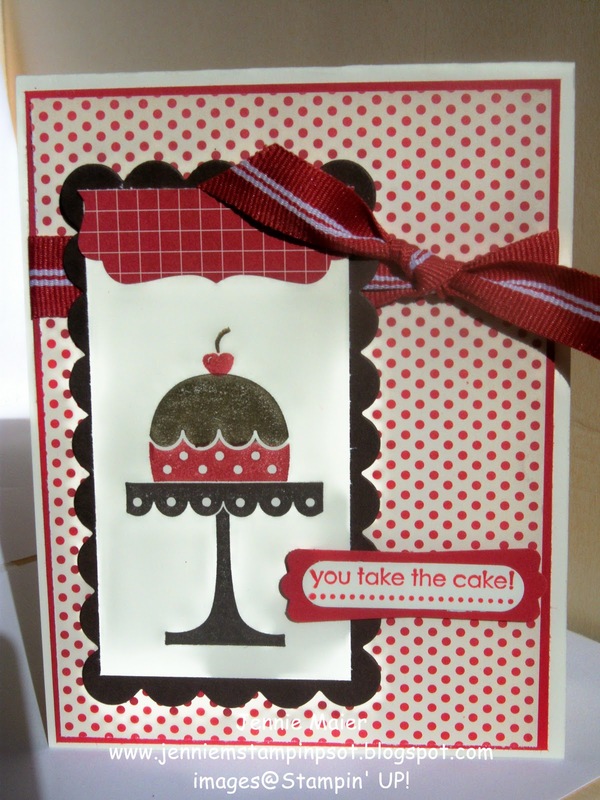 I stamped the greeting with Cherry Cobbler on Crumb Cake and punched it out with the Scallop Oval punch. That was layered on to a Cherry Cobbler piece punched with the 2 by 1 3/8 inch XL Oval punch. Finally, some Cherry Cobbler seam binding finishes it off. Here's a card and little box of tea lights I'm bringing to the in-laws today. I packed the box away before I added a pic of the inside, trust me, that's cute too! I think they'd qualify for the SUO Challenge #6 of Thanksgiving Table Art here. I found the tutorial for this cute little box that holds 4 decorated tea lights on Jill Hillard's awesome blog here. Both the card and box were made with the Autumn Spice DSP. The card has Cajun Craze, Early Espresso, Very Vanilla and More Mustard card stock too. The box has Early Espresso and the bottom base. 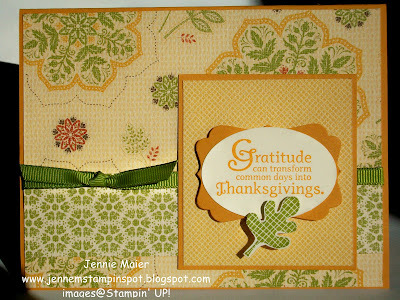 I used the Day of Gratitude stamp set for both too. The oval Coluzzle was used for the card and the 1 1/4 inch Circle punch for the box. Finally, both use 1/8 inch Early Espresso taffeta ribbon. My card qualifies for two challenges at Splitcoast. First, the Color Combo#298 of Chocolate Chip, Cherry Cobbler and Crumb Cake here. And second, the Sketch Challenge #308 here. 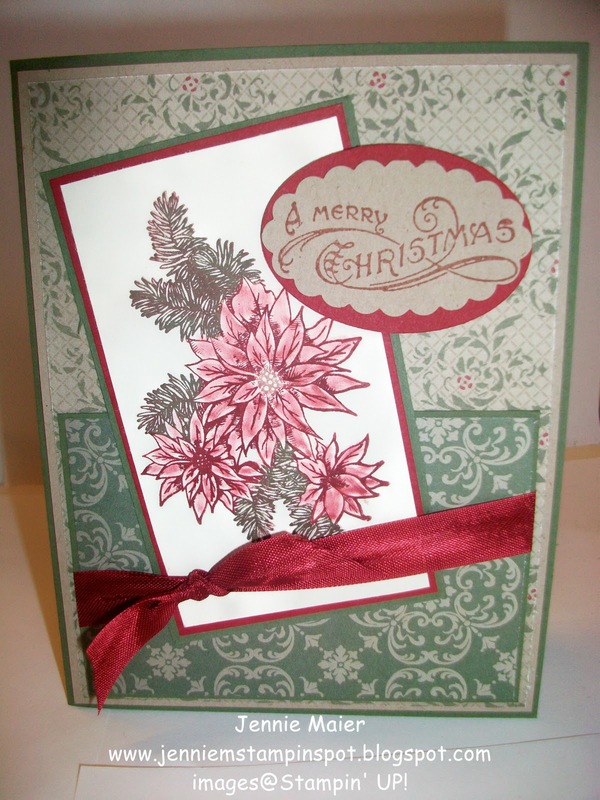 The base is Cherry Cobbler card stock and I used 4 different papers from the Deck the Halls DSP. I used both Chocolate Chip and Cherry Cobbler card stock to mat those Designer Papers. I stamped the poinsettia from Bells & Boughs on Very Vanilla, colored it with Cherry Cobbler Classic ink and blender pens and cut it out and popped it up with Stampin dimensionals. 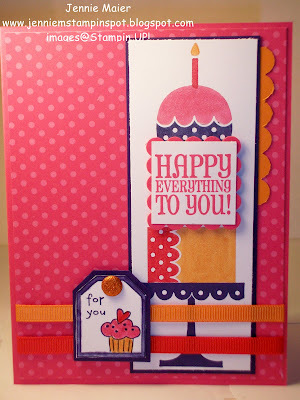 I stamped the greeting from the same set in Cherry Cobbler and punched it out with the Scallop Oval punch and popped it up with Stampin dimensionals. This card is for the Stamping 411 #178 here. I used the new to me Deck the Halls DSP and coordinating Bells and Boughs stamp set. This card was sooo quick cuz I used the DSP as the focal point. I started with an Always Artichoke card stock base. I stamped the bells in Always Artichoke on Very Vanilla. I used Always Artichoke, Cherry Cobbler and Crumb Cake Classic Inks and Blender pens to color in the image. That was matted with some Always Artichoke and Cherry Cobbler card stock. Finally, some 1/2 inch Cherry Cobbler seam binding finishes it off. 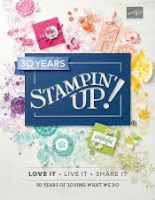 Don't miss out on the awesome Stampin UP! Specials going on today thru November 30th! There are products 50%, 40% and 30% off! 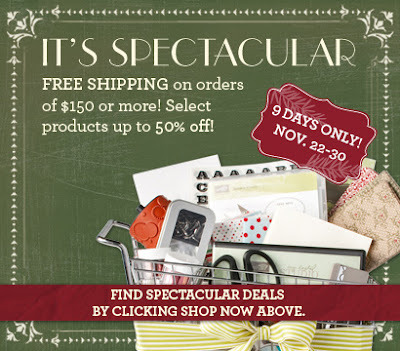 PLUS-FREE SHIPPING on orders $150 or more! 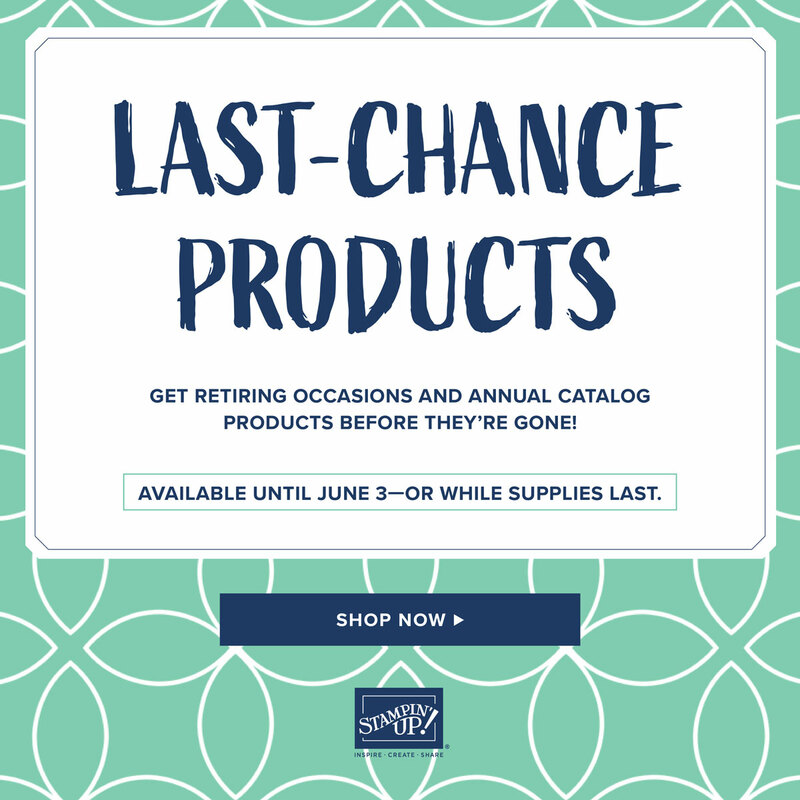 Click here for the list of products on sale. 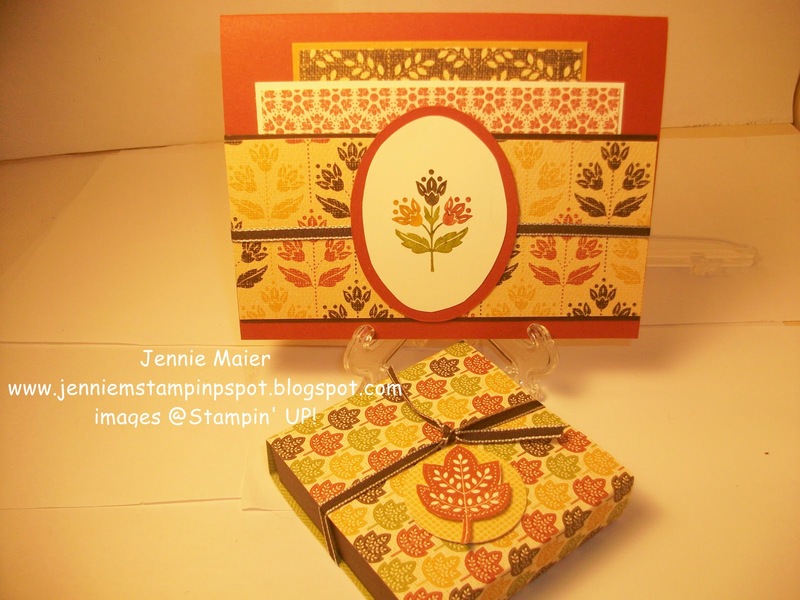 You can call me, email me or place your order online at http://www.jenniemstamps.stampinup.net/. Shop from the comfort of your home! It's my beautiful daughter's 16th birthday today-Happy Birthday Megan! The wrapping paper was my inspiration for the colors and I used the Clean & Simple FTL#117 here to make this bright and cheery card for my bright, beautiful, funny, loving daughter! She goes for her drivers licence test on Monday so we'll see what happens then. I used Crumb Cake for the card stock base. Then I added some Real Red and DSP from the Patterns DSP Brights stack. I colored the cupcake from Got Treats with the Melon Mambo, Pumpkin Pie and Tempting Turquoise Stampin write markers and punched that out with the XL 1 3/4 inch Circle punch. I added a Pumpkin Pie piece punched with the XL Fancy Flower punch. 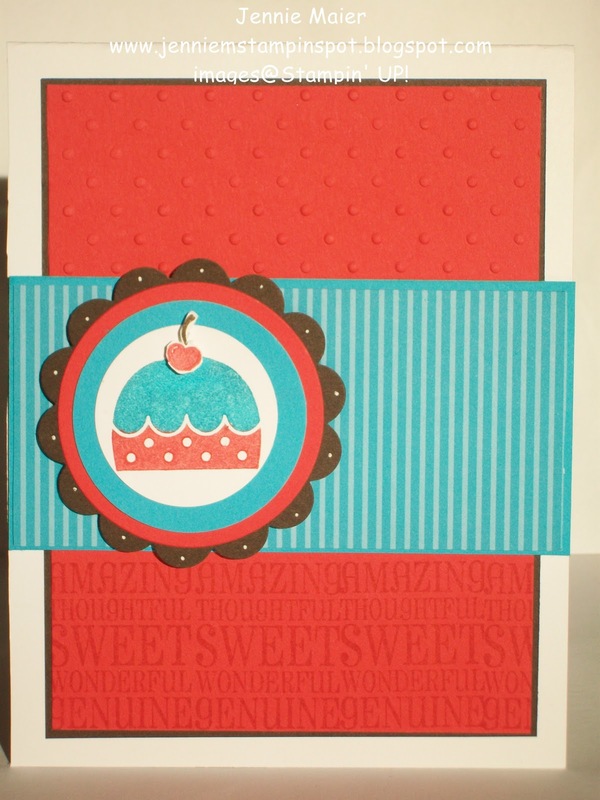 I colored "Sweet" from Got Treats with the Real Red Stampin write marker and 16 from a non-SU set. That was punched with the 1 1/4 inch circle punch and added to a Real Red piece punched with the 1 3/8 inch circle punch. I used the Perfect Plum and Real Red Stampin write markers to color the cupcake from On a Pedestal, punched it out with the 1 3/8 inch circle punch. That was layered onto a Perfect Plum piece punched with the 1 3/4 in XL Scallop circle punch. A strip of Tempting Turquoise was run thru the Scallop Edge border punch. Finally, Happy Birthday from On Your Birthday was stamped in Real Red and punched out with the Word Window punch. I put away my Christmas projects to make a birthday card for my niece, Lily. 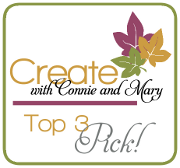 I used the Create with Connie & Mary sketch#125 here after I saw a darling card by Carrie Gaskin that used this sketch. I started with a base of Melon Mambo and added DSP from the Patterns DSP Brights Stack. I used my Stamp-a-ma-jig for all the stamps from On a Pedestal. The base was stamped in Concord Crush, the present in Real Red and Pumpkin Pie and the top cupcake in Concord Crush and Melon Mambo. Oh, and the candle in Real Red and Pumpkin Pie. I stamped the sentiment in Melon Mambo, punched it out with the 1 1/4 inch Square punch and layered in onto a Melon Mambo piece punched with the Scallop Square punch. That whole piece was then popped up with Stampin dimensionals.I matted that with Concord Crush and added a strip of Pumpkin Pie that was run thru the Scallop Edge Border punch. 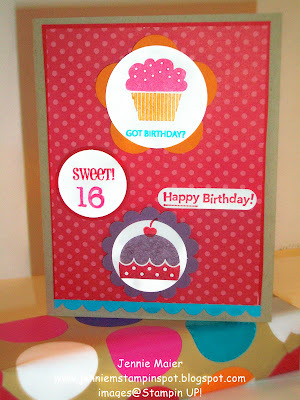 I stamped the tag from Birthday Bakery in Concord Crush and added a Concord piece punched with the Large Tag punch. I colored that in with Concord Crush, Melon Mambo, Pumpkin Pie and Real Red Stampin write markers. Then I added a Pumpkin Pie Glitter brad and more Stampin dimensionals. Finally, some 1/4 inch Pumpkin Pie and Real Red grosgrain finish it off. 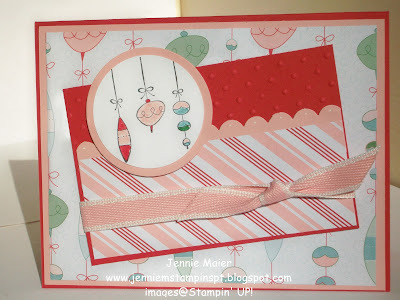 Here's another Candy Cane Christmas DSP card but I used the Short & Sweet stamp set. It also qualifies for three challenges. First, PPA#69 here. 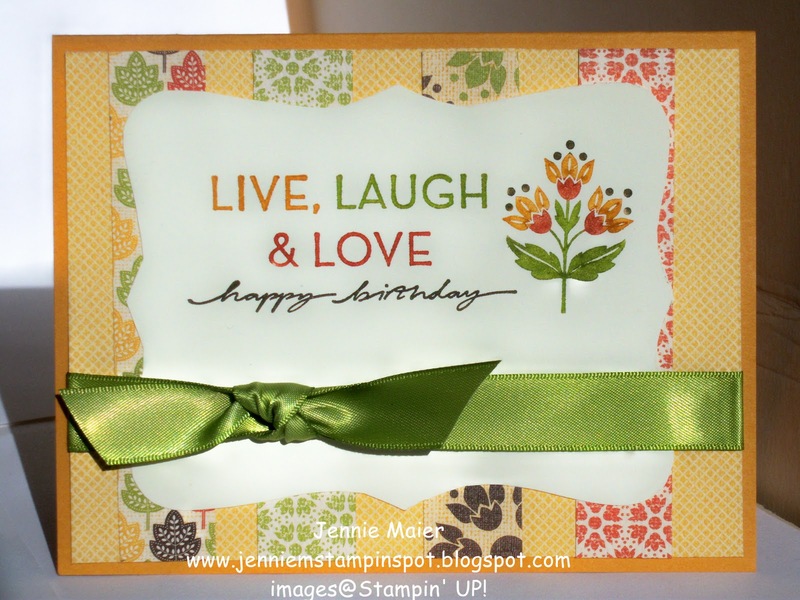 Second, the Stamping 411 Color Inspiration #144 here. And third, the Splitcoast Demo Challenge #176, CAS Holiday Cards, here. Real Red textured card stock is the card base. Then I used the 1 3/8 inch Square punch to punch the four squares from the Candy Cane Christmas DSP. I ran a piece of Baha Breeze card stock thru the Scallop Edge border punch and added dots with the White gel pen. 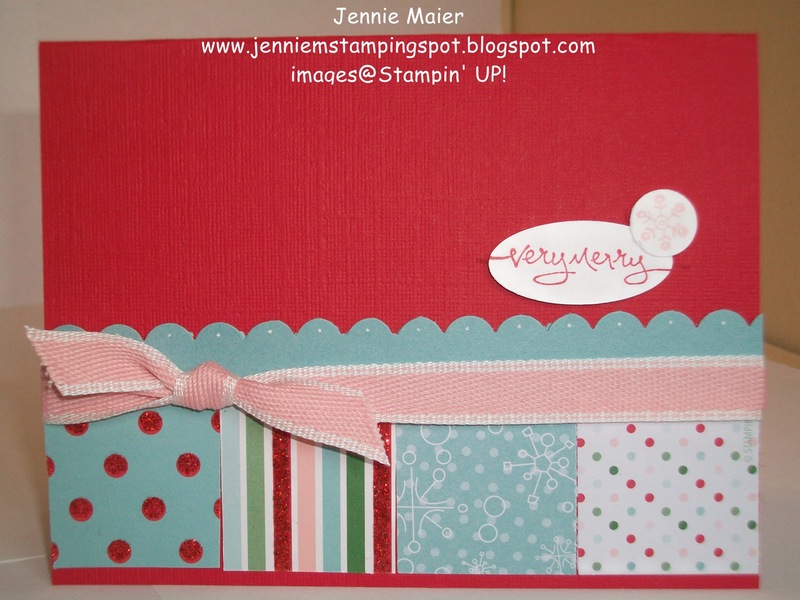 I stamped Very Merry from Short and Sweet in Real Red on Whisper White and punched that out with the 1 3/8 in by 5/8 in Oval punch. 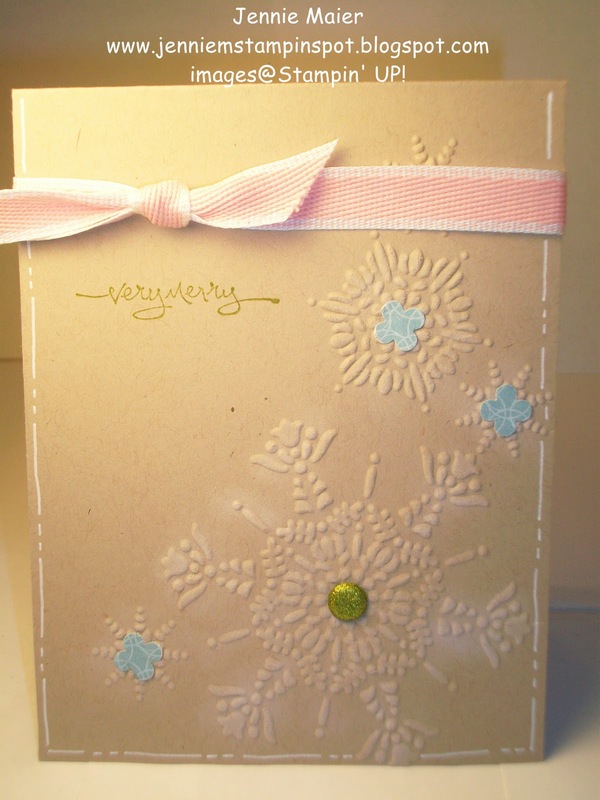 I stamped the snowflake from that set in Blushing Bride and punched it out with the 1/2 inch Circle punch. I popped those two pieces up with Stampin dimensionals. Finally, a piece of 1/2 inch Blushing Bride stitched-poly finishes it off. Since I had A Cute Christmas on my desk, I decided to use it for today's card too. This one covers the Splitcoast Color Challenge #297 here and the Splitcoast Sketch Challenge #307 here. I started with a Pear Pizzazz card stock base and added DSP from the DSP Pack In-Color. Then there's Baha Breeze DSP from the Candy Cane Christmas DSP. And then more Pear DSP from the DSP Pack In-Color. I stamped the mittens from A Cute Christmas in Perfect Plum and colored them with my Baha Breeze, Pear Pizzazz and Perfect Plum Stampin write markers. Get Well Wishes from Teeny Tiny Wishes was stamped in Perfect Plum. Finally, a piece of 1/8 inch Marina Mist taffeta finishes it off. This is for the MojoMonday sketch#165 here. 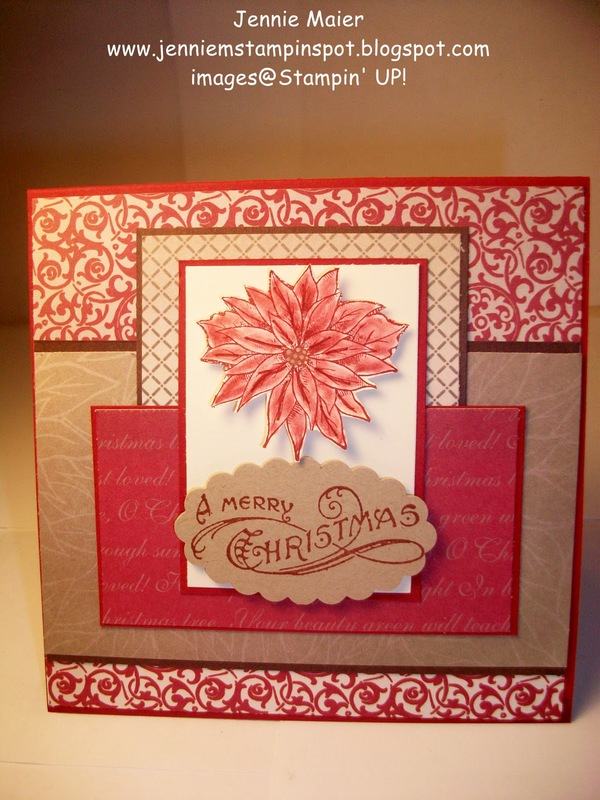 I started with a Real Red card stock base, added a layer of Blushing Bride and then some Candy Cane Christmas DSP. I ran a Real Red piece thru the Big Shot with the Perfect Polka-dot textured impressions embossing folder. I added some more Candy Cane Christmas DSP to that and a piece of Blushing Bride that I ran thru the Scallop edge border punch. I stamped the ornaments from A Cute Christmas in Basic Black and used the XL 1 3/4 inch circle punch for that circle. I used the Blushing Bride, Baha Breeze, Garden Green and Real Red Stampin Write markers to color in the ornaments. 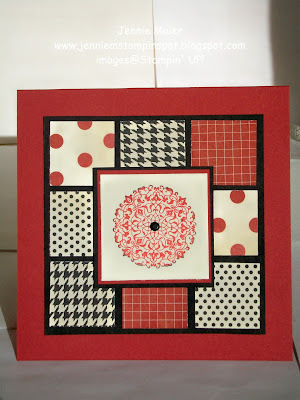 The Circles #2 Bigz die was used to make the Blushing Bride circle and that was popped up with Stampin dimensionals. Finally, some 1/2 inch Blushing Bride stitched-poly ribbon finishes it off. Here's my card for the Stamping 411 sketch#177. The base is More Mustard and I added some Autumn Spice Specialty DSP. I stamped the sentiment from Day of Gratitude in More Mustard on Very Vanilla then punched it out with the 2 by 1 3/8 inch Oval punch. That was layered on to a More Mustard piece punched with the XL Decorative Label punch then popped up with Stampin dimensionals. I also stamped the leaf from Falling Leaves in Old Olive, cut it out and popped it up with a Stampin dimensional. Finally, a piece of 1/4 inch Old Olive grosgrain finishes it off. This card is for the Clean & Simple FTL#116 here. I used Rich Razzleberry for the base and added some Razzleberry Patterns DSP Brights Stack papers. I cut out two Top Note dies, one in Old Olive and the other in Very Vanilla. I trimmed down the Vanilla one and stamped the ornaments twice in Old Olive. 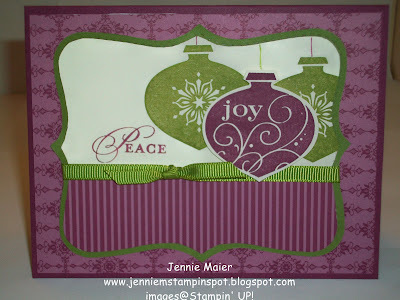 I stamped the joy ornament in Rich Razzleberry, punched it out with the Ornament punch and popped it up with Stampin dimensionals. I used the Old Olive and Rich Razzleberry Stampin write markers to draw the hangers. 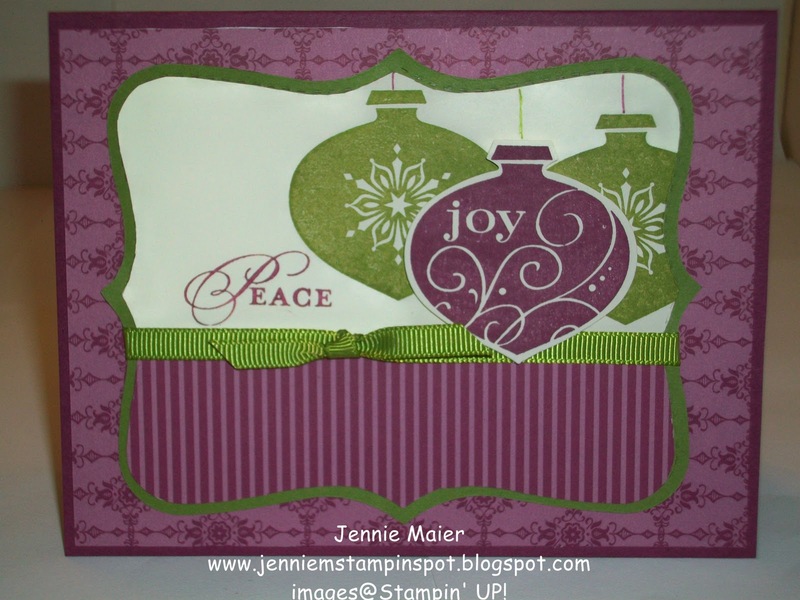 I also used the Razzleberry Stampin write marker to color just the Peace part of the stamp from All Holidays. Finally, a piece of 1/4 inch Old Olive grosgrain finishes it off. I made this one after seeing a sample in a Stampin' Success Magazine. If I remember correctly, the sample was smaller but I just added my own flair for a regular A2 size card. I started with a Crumb Cake base and used some DSP from the Love Letter DSP. I matted that with Basic Black. I stamped the flowers from Petal Pizzazz in Daffodil Delight and Basic Black. I used the Dot Dot Dot stamp and Basic Black to add the dots to one of the flowers. 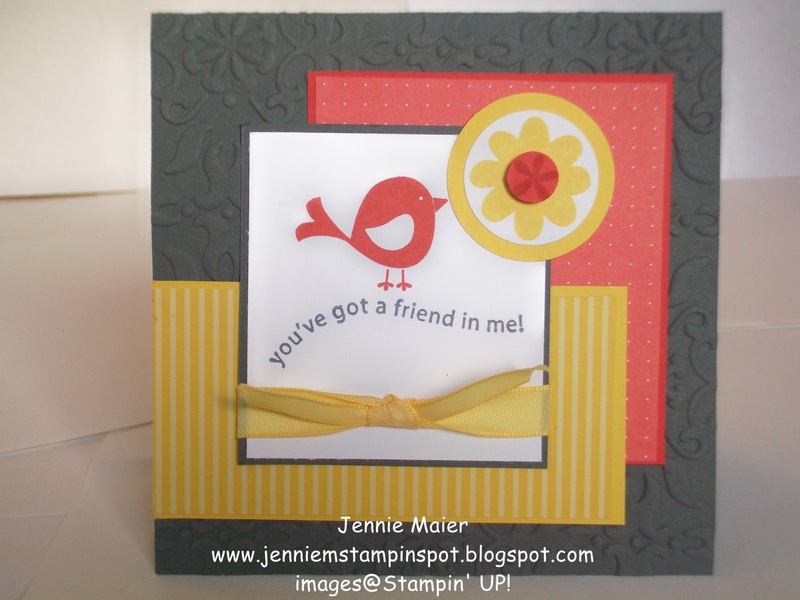 The last little one was popped up with a Stampin dimensional. The black circle was cut out with the Circles #2 Bigz Die. 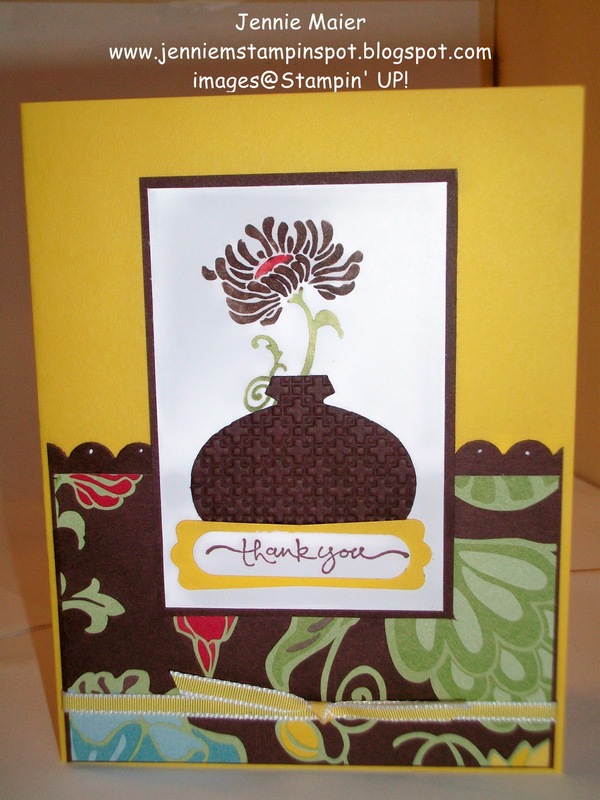 I stamped the thanks from Perfect Punches in Daffodil Delight and punched it out with the 1 3/4 by 7/8 inch oval punch and layered it onto a Basic Black piece punched with the Scallop oval punch. Finally, a piece of 3/8 inch Daffodil Delight taffeta finishes it off. I made this anniversary card for the PPA#68 Inspiration Challenge here. I saw this picture, was drawn to the tablecloth, and thought of Rose Red and Perfect Plum together. So I started with a base of Rose Red and ran that thru the Big Shot with the Vintage Wallpaper textured impressions embossing folder. I also used the Corner rounder punch on the bottom corners. I colored the circle image from Artistic Etchings with my Rose Red Stampin write marker then used the Perfect Plum marker on the edge. I trimmed that down a bit and added it to a Rose Red piece punched with the 1 3/ 4 XL circle punch. Then I added a Perfect Plum piece punched with the 2 3/8 inch XL scallop circle punch. I popped that all up with Stampin dimensionals. I ran a strip of Perfect Plum thru the Scallop Edge border punch and added dots to both Plum pieces with the White gel pen. I stamped Amour from Artistic Etchings in Perfect Plum on the Plum piece. Finally, some 5/8 inch Very Vanilla grosgrain finishes it off. This card covers two challenges at Splitcoast. First, the Color Combo #296 here of Poppy Parade, Tempting Turquoise and White. And second, the Sketch Challenge #306 here. I took a little creative liberty and added a tad of Early Espresso too. I started with a base of Whisper White. I ran some Poppy Parade thru the Big Shot with the Perfect Polka-dot textured impressions embossing folder. I used my Stamp-a-ma-jig to line up the word stamp from On a Pedestal on the bottom of the Poppy Parade. I matted that with Early Espresso. I colored in the cupcake with my Poppy Parade and Tempting Turquoise Stampin write markers then also used the Early Espresso marker on the cherry. 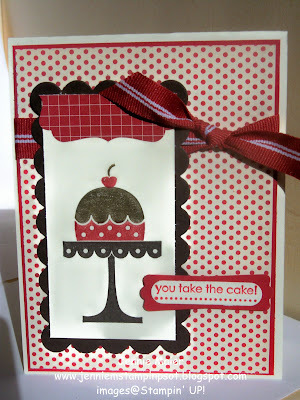 I popped the cherry up with a tiny Stampin dimensional. I punched out the cupcake with the 1 3/8 inch circle punch, added a Turquoise piece punched with the 1 3/4 inch XL circle punch, a Poppy circle from the Circles #2 Bigz die and an Espresso piece punched with the 2 3/8 inch XL Scallop Circle punch. I also added dots with my White gel pen. A strip of Tempting Turquoise from the Patterns DSP Brights Stack finishes it off. So this one is for the Clean & Simple #92 challenge over at Splitcoast here. It was to make a CAS card using Pink Krafty Olives for the colors with an option of Marina Mist(I used Baha Breeze instead). I started by running the Crumb Cake card stock thru the Big Shot with the Northern Flurry textured impressions embossing folder. I sponged some Whisper White Craft ink on the snowflakes to make them pop a bit. I punched out some Baha Breeze DSP from Elegant Soiree with the Itty Bitty Shapes punches pack and added them to three of the snowflakes. I used an Old Olive Glimmer Brights brad in the center of the largest snowflake. I drew some white lines with my White gel pen. Very Merry from Short and Sweet was stamped in Old Olive. Finally, I added some 1/2 inch Blushing Bride stitched-poly ribbon. This card is for the MojoMonday sketch#164 here. The base is Baha Breeze with some Real Red layered on to that. I used three different patterns from the Candy Cane Christmas Specialty DSP. I stamped the snowman from A Cute Christmas in Basic Black on Whisper White and colored it with the Baha Breeze, Blushing Bride, Garden Green and Real Red Stampin write markers. Then I used my Blender pen and the Baha Breeze stamp pad to color some "faux snow". I punched that out with the XL 1 3/4 inch circle punch and used the Circles #2 Big Shot die to cut out the Baha Breeze circle. 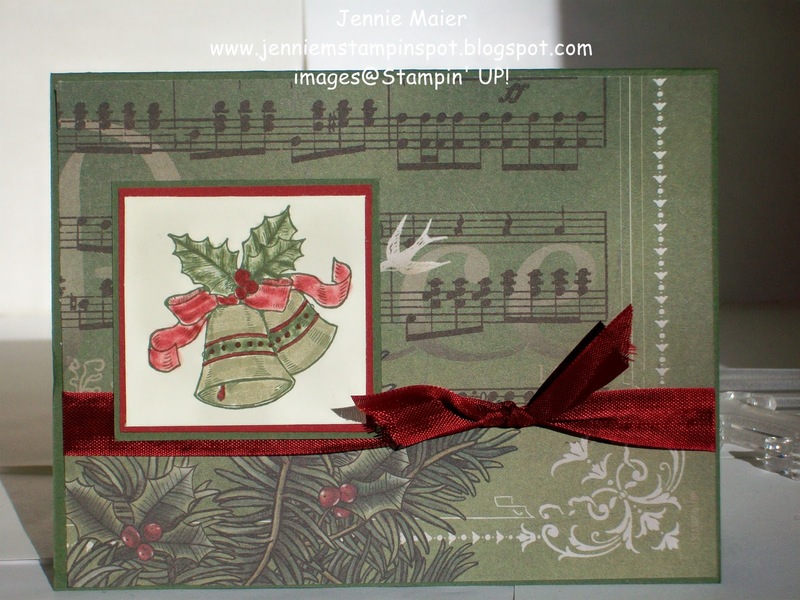 I used my Real Red Stampin write marker to color in "Merry & Bright" from Season of Joy , matted it with some Real Red card stock and popped it up with Stampin dimensionals. Finally, some 5/8 inch Real Red grosgrain finishes it off. This is a really happy card, if I do say so myself! I made it for Stamping 411 #176 here. 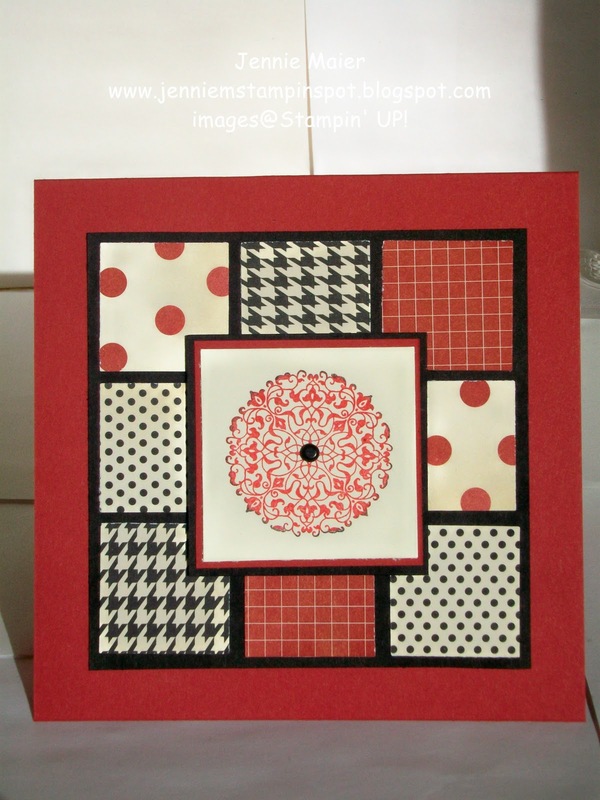 I started with a base of Poppy Parade card stock and added some Poppy DSP from the DSP Pack In-Color. On Whisper White, I stamped the stems in Wild Wasabi and the long flower in Poppy Parade. 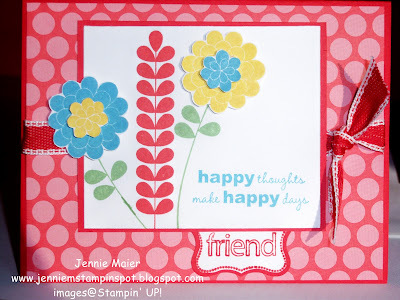 I stamped and cut out the round flowers in Daffodil Delight and Marina Mist. I popped them all up with Stampin dimensionals. I stamped the sentiment from Apple Blossoms in Marina Mist. I then colored half of the friend stamp from Perfect Punches with my Poppy Parade Stampin write marker, punched it with the Curly Label punch and trimmed it down a little bit. I then layered that onto a Poppy Parade piece punched with the Curly Label punch. Finally, a piece of 1/2 inch Poppy Parade stitched-poly ribbon finishes it off. I made this card for the Clean & Simple Stamping FTL#115 here. The base is Rich Razzleberry and I added some Whisper White. I rounded the corners of both pieces with the Corner Rounder punch. I used my Stamp-a-ma-jig to line up the flowers from Printed Petals. I stamped them in Rich Razzleberry, Melon Mambo, Tempting Turquoise and Daffodil Delight. I also stamped one of the little flowers in Daffodil Delight, punched it out with the Itty Bitty Shapes punches pack and popped it up with a Stampin dimensional. Thinking of you from Trendy Trees was stamped in Rich Razzleberry. Finally, a piece of 1/4 inch Rich Razzleberry grosgrain finishes it off. I made a card for the SUO Challenge#5, Punch Art, here. I started with a base of Daffodil Delight and added some Greenhouse Gala DSP. That was layered on to some Chocolate Chip card stock. I ran one edge of the Chocolate Chip thru the Scallop Edge border punch and added dots with the White gel pen. I colored the flower stamp from Friends Never Fade with my Chocolate Chip, Real Red and Pear Pizzazz Stampin write markers and stamped that on Whisper White. I ran a piece of Chocolate Chip card stock thru the Big Shot with the Square Lattice textured impressions folder. I then used the Ornament punch to punch out the "vase". I stamped thank you from Short & Sweet in Chocolate Chip on Whisper White and punched that out with the Word Window punch. I layered that onto a Daffodil Delight piece punched with the Modern Label punch and adhered that piece over the Chocolate Chip ornament piece, making it look like a vase. A piece of 1/8 inch Daffodil Delight taffeta ribbon finishes it off. 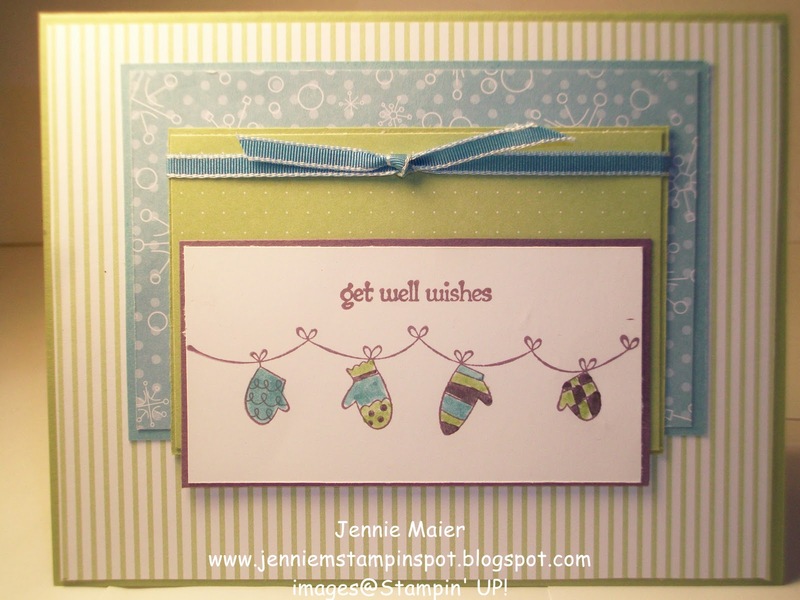 I'm making up for not stamping yesterday with a card for two challenges. First, I used the Splitcoast sketch#305 here and the PPA #67 Color Challenge here. The colors are Daffodil Delight, Basic Gray and Poppy Parade. So I started with a 4 1/4 square card and ran it thru the Big Shot with the Vintage Wallpaper textured impressions embossing folder. I added Poppy Parade DSP from the DSP Pack In-Color and Daffodil Delight DSP from the Patterns DSP Brights stack. I stamped the sentiment from Cheep Talk in Basic Gray, the bird in Poppy Parade and the flower in Daffodil Delight. Then I stamped the tiny flower in Poppy Parade on the same card stock and punched it out with the circle punch from the Itty Bitty Shapes punches pack. 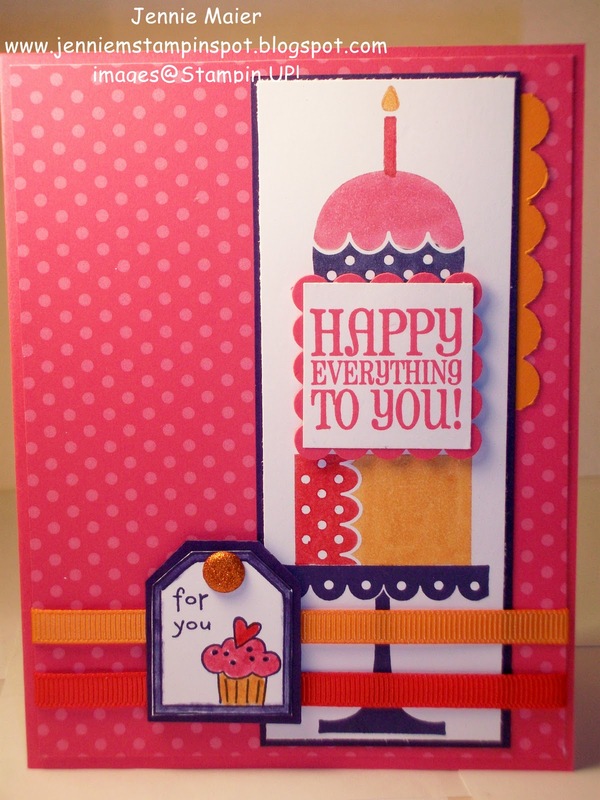 I popped that up with a little bit of a Stampin dimensional. I then punched out the big flower with the 1 inch circle punch and added a piece of Daffodil Delight punched with the 1 1/4 inch circle punch. Finally, a piece of 3/8 inch Daffodil Delight taffeta finishes it off. This is my card for the Stamping 411 #175 sketch here. The base is More Mustard card stock and I added DSP from Autumn Spice Specialty DSP. I cut out a Top Note of Very Vanilla with the Top Note Bigz die. I colored the birthday stamp from On Your Birthday and the flower stamp from Day of Gratitude with the Early Espresso, Cajun Craze, More Mustard and Old Olive Stampin write markers. Finally, a piece of 5/8 inch Old Olive satin ribbon finishes it off. This card is my try at MOJO#163 here. It came together pretty quickly! I started with a Very Vanilla base and added Riding Hood Red card stock and DSP from Love Letter. I used my Scallop Square bigz die to cut a square from Early Espresso and just trimmed it down for a mat. On Very Vanilla I stamped the cake base from On a Pedestal in Early Espresso. I used my markers to color the cake and cherry in Riding Hood Red and Early Espresso. I used the Decorative Label punch on some more Love Letter DSP. I stamped the sentiment from Party Hearty in Riding Hood Red on Very Vanilla. I punched that out with the Word Window punch and layered that on to a Riding Hood Red piece punched with the Modern Label punch. Finally, I added some retired Riding Hood Red ribbon. available til June 3 or while supplies last! 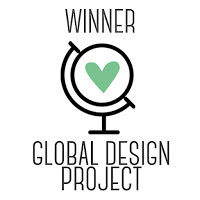 I was a winner at the Global Design Project! 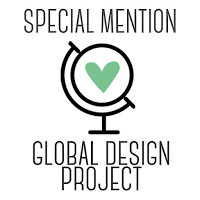 I was a Special Mention at the Global Design Project! 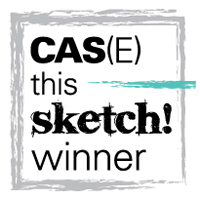 I was a CAS(E) this Sketch Winner! 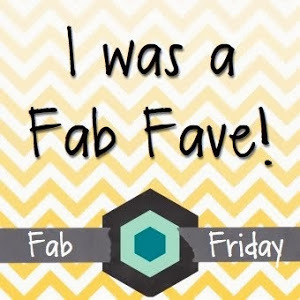 I was a Fab Friday Fave! I was a Top 3 Pick at SUO Challenges! 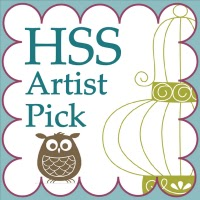 I was an Artist Pick at Hand Stamped Sentiments! 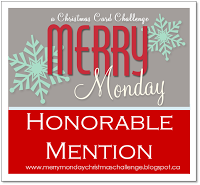 I was an Honorable Mention on Merry Monday! This is a personal site of Jennie Maier, an Independent Stampin Up Demonstrator. I am responsible for all content. 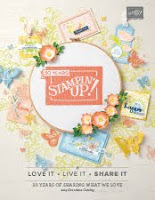 Stampin Up doesn't endorse the use of or content of its supplies or images. I'm a stay-at-home mom of three who loves stamping, scrapbooking and paper crafting. If I'm not at my kids games, school or driving the taxi I can be found in my basement crafting corner.